He Died at 6 O'Clock Yesterday Evening. Suddenly Stricken Sunday. Borne to His home in Unconscious Condition and Continued to Grow Worse. Capt. W. L. Boyd died at his residence on West Louisiana street at 6 'clock last evening. As previously announced, Capt Boyd was suddenly stricken Sunday evening while on his way home from ..... and was borne in an unconscious condition to his residence where despite everything that could be done to restore him to health and strength, he continued to grow worse until he passed away the hour stated. Capt. Boyd was in his seventy sixth year and was a native of the state of Illinois, from which he moved to Missouri. Soon after the out break of the civil war he enlisted in the Union army in which he served with credit. Just after the war he became interested in the general merchandise business then being conducted in this city by West & Murray, the firm being composed of J. A. West and T. H. Murray, now deceased. In 1867 Mr. West retired from the firm and in 18– Mr. Murray also retired. Capt. Boyd moving here in 1870 and continuing the business until 1882 when he disposed his stock. The business was conducted on the west side of the square on the site of the building now occupied by J. S. & S. D. Heard. Our townsman, T. J. Cloyd, was a salesman in the establishment from May 1870 until Capt. Boyd retired from business in February 1882. 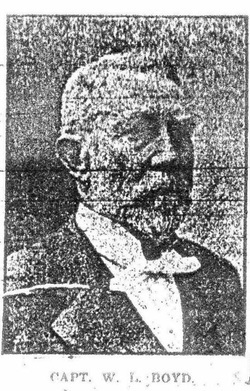 Capt Boyd was one of the early stock holders in the Collin County Bank and was for a time cashier of the institution, before it became a national bank. On retiring from the bank about 1887 he became engaged in money lending, etc., having for a number of years had an office upstairs in the Newsome building on the southeast corner of the square. Capt. Boyd was twice married. The maiden name of his first wife, whom he married before coming to McKinney, being Miss Emma O'Hara. They boarded for several years at the home of T. J. Cloyd's father, W. S. Cloyd, where his first wife died, and was buried in Pecan Grove cemetery beside the remains of their two sons who died when quite young. He also has two children buried in Illinois. Capt. Boyd married the second time, Miss Mary Crane, about 1878, his wife surviving him. They have no children. Capt. Boyd was a true upright Mason, having gone through the various degrees of this order to that of Knight Templar and was also a member of the McKinney Elks lodge. He was a genial man and substantial citizen and his death is deeply deplored by all. The funeral will take place from his late residence at 2:30 o'clock tomorrow afternoon under Masonic auspices, services to be conducted at the residence by Bishop A. C. Garrett of Dallas, a warm personal friend of the deceased, after which the interment will be made at Pecan Grove cemetery. It is hereby certified, that it appears from the Records of this office, that William L. Boyd joined for service as Captain, Company A, (Birge’s Sharp Shooters) 14th Regiment, Missouri Volunteer Infantry, September 4, 1861, Transferred as Captain, Company A, 66th Regiment, Illinois Volunteer Infantry, commissioned December 5, 1861, to rank from December 5, 1861. Mustered out, March 31, 1865. Expiration of term of service. Age, at date of enlistment, 26 years; Height, 5 feet, 7 inches; Hair, Light; Eyes, blue; complexion, Light; Occupation, soldier; Native of Armagh, Ireland. Residence, St. Louis Missouri.